When the Lower East Side Jewish Conservancy (LESJC) decided to promote a new walking tour, Jewish Gangs of the Lower East Side, Executive Director Laurie Tobias Cohen envisioned a press release. Press Release to New York event media, calendars and Jewish media. 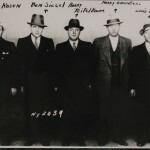 All the copy highlighted the names of the most famous gangsters (Bugsy Siegel and Meyer Lansky), as well as shedding light on an open secret of New York’s Jewish past. As a result of the integrated marketing campaign, the tour was oversubscribed; participants included many first-time attendees, primarily of the under-40 demographic.